I bought 8pcs of the BOB-14589 dev boards. made a simple two-way board test with success. can someone please let me know if it's normal to have i2c pull-ups resistor on each boards ? let say having four boards, exactly like the drawing on spec sheet page 12. I think it makes no sense to have pull-ups on each.. or maybe the PCA6915 is doing something to the i2c line that I'm not understanding well. and I realize that all of them have <shorted> pin 1 & 2 and pin 7 & 8 ! --is this normal ? I guess I'll have to use; https://www.sparkfun.com/products/716 instead.. I am not sure we have much information to go on regarding stringing four or more of the Differential I2C Breakouts but we will look into that and get back to you with any information we can dig up. 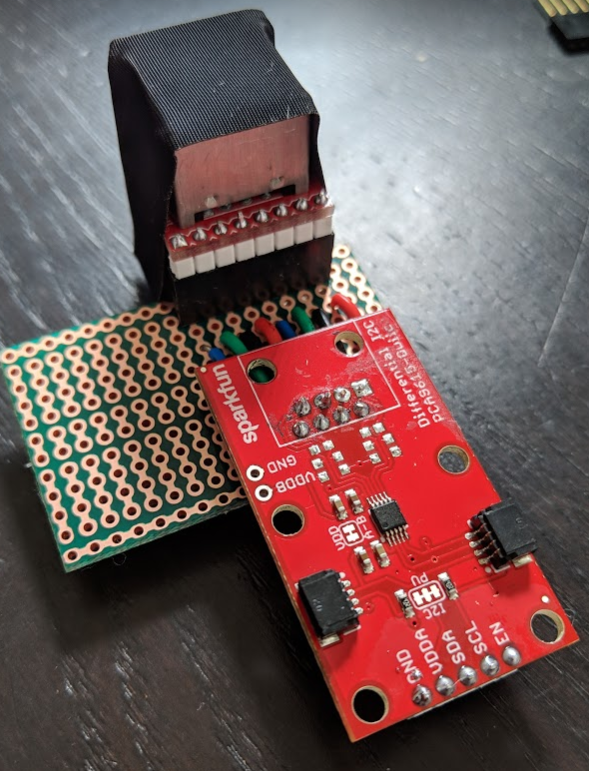 You will most likely need to disable the I2C pull-up resistors as you add more of these to the bus so your master can still pull those lines low. As you add more, the resistance will hit a point where it is too high for the master to effectively toggle those lines for sending data. This is just a quick response in relation to your final question regarding the MagJack Breakouts you are trying to use. 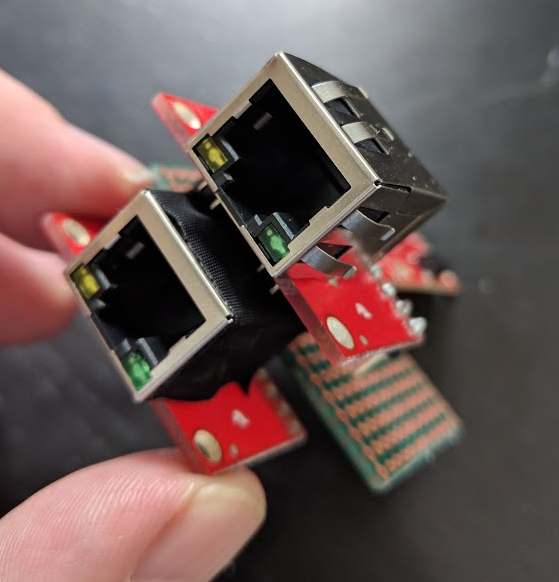 Those breakouts are designed for ethernet only and are not a standard RJ45 connector like what is populated on the Differential I2C Breakouts. The pins are netted together internally like the MagJack Datasheet shows and it will not work for your application. You are correct in your thinking. 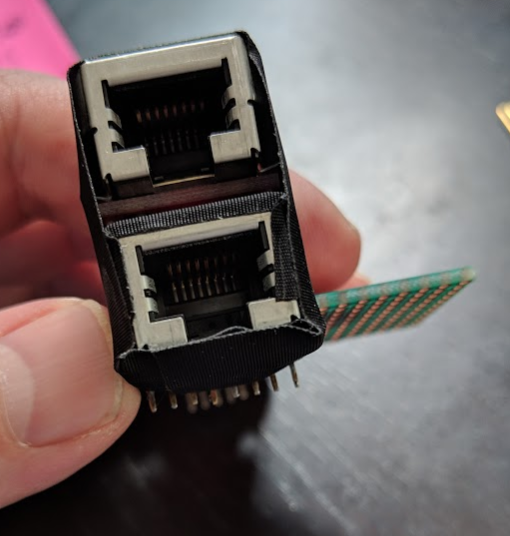 You will need to use the RJ45 Breakout and connectors. If you have some of these you do not wish to use and have not soldered to yet, please submit an RMA on this page. 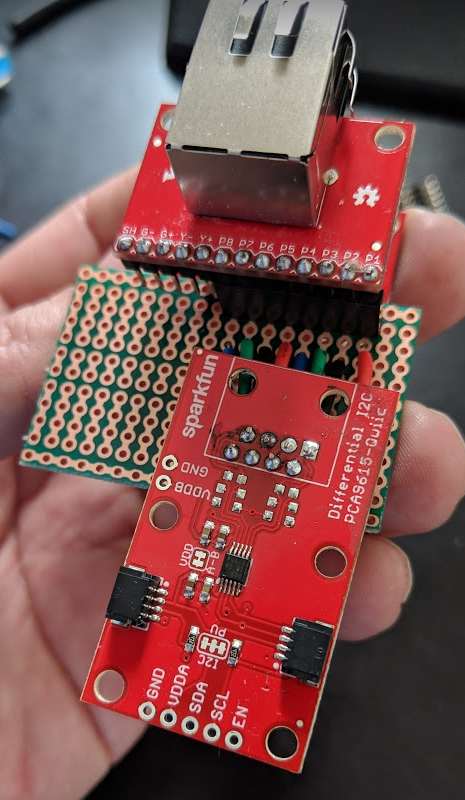 I hope this helps explain any confusion caused by the MagJack Breakouts and gives some insight into how you can use multiple I2C Differential Breakouts on the same bus. will not test and let you know how it goes with four BOB-14589 on one line as a starting point. if your or your team finds out suggestions about this setup please let me know !